One muscle that is not easy to overdevelop is the deltoid. Yep! Your shoulders. Many people can overbuild their thighs, or even their chests...but shoulders? No way. They just cannot be too big. The biggest shoulders in bodybuilding used to belong to the immortal John Carl Grimek. They were astonishing, Then along came Britisher Reg Park whose deltoid development put Grimek in the shade. Superseding Park was Sergio Oliva...and then it was the great Arnold Schwarzenegger. Currently the "best deltoids" title is shared by several of the top-liners of the sport:: Dennis Tinerino. Mike Mentzer, and Roy Callender...Casey Viator, too, has phenomenal delts. There are scores of shoulder exercises because the deltoid is a three-headed muscle. 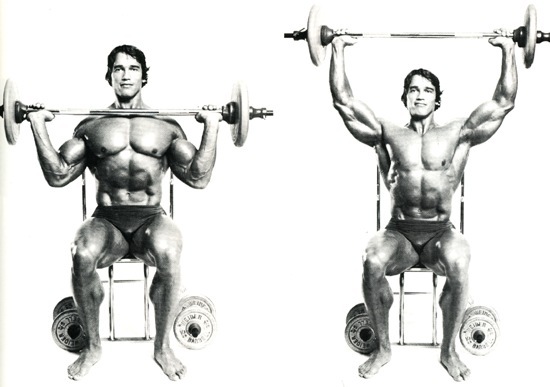 Any type of forward raise brings the frontal deltoid ito play, but then this part is worked pretty thoroughly by the regular bench press. Then there's the posterior deltoid, sometimes known as the rear deltoid. This is brought into action by raising the arms while the torso is in the bent-over position, face downwards. Too, the rear delt is also worked extensively in the bent-over rowing exercise. The side delt! Ah, that's the one, it gives you width. Build this lateral head and you will really impress. that is what want, isn't it? And you won't need that much either. Just an inch on your overall shoulder width will make a huge difference. You'll look like superman. So how about devoting 8-10 weeks on some lateral shoulder specialization? Go on, spoil yourself. Start with the four exercises shown and then proceed with squats, bench presses, rowing, abs, calves, biceps, and triceps. Keep to one exercise only for your other bodyparts. The idea is to blitz the side delts but, at the same time, to keep the other areas "up" if not actually growing. Your first deltoid exercise is the" wide-grip press", combination shoulder exercise which really slaps beef onto those delts. Start by taking the weight from a pair of squat racks and press the weight up and down for four sets of six reps. Remember to wear a strong lifting belt during the exercise. It will give you the support to really push the weight aloft. Do not, however, allow yourself to lapse into a sloppy exercise style. Excessive lean-back or jerking up the weight is not the way to build up the deltoid mass. Sure, you may be able to ultimately hoist up more weight, but that's not what it's all about, is it? We are after shoulder mass. If you want strength, then go for it at another time. (Get yourself an Olympic bar and squat, press, deadlift and bench your heart out for sets of two to three reps. Strength will come.) For now, though, we are pressing for shoulder size and width, go for six reps -- four sets. The second exercise is the "standing dumbbell press". Keep the elbows back throughout the movement, lower slowly, and repeat. Do not bend the knees or lean back, You may do this exercise in the seated position if you wish, Three sets -- eight reps. Your third exercise is the "two-dumbbell lateral raise". As the weights reach shoulder level turn the palms over so that the little finger is uppermost. Concentrate the action into your shoulders. Never regard the dumbbells as a weight that you have to get up. Your mind should be zeroed in on making the delts feel the action. Go for three hard sets of eight reps. Your last shoulder exercise is the "lean-over side raise". Use a light dumbbell to start with. Begin the lift slowly, very slowly. Bend your arm slightly and keep your mind on the deltoid. It will help to hold the elbow as high as possible throughout the action. Three sets of ten reps will do it!